Angus MacInnis was born in 1884 at Glen Williams, Prince Edward Island. In 1908 he moved to Vancouver where he worked as a milk wagon driver and later as a conductor and motorman for the B.C. Electric Railway. An interest in the trade union movement led him to become business agent for the Amalgamated Association of Street, Electrical Railway and Motor Coach Employees of America, Division 101. Politically active on both the local and national scene, he was elected M.P. for Vancouver South for the Independent Labour Party in 1930 and he served the same constituency as a member of the C.C.F. (1935-1957). In 1932, MacInnis married Grace Woodsworth. MacInnis sat on the C.C.F. National Executive from 1933-1950 and was Deputy National Leader of the C.C.F. from 1942 to 1957. His awards include an Honorary Doctor of Laws from the University of British Columbia and the Garnett Sedgewick award from the U.B.C. Civil Liberties Union for his position on the Japanese-Canadian situation during the Second World War. This fonds was originally intended to be a subfonds within the Angus MacInnis memorial collection. 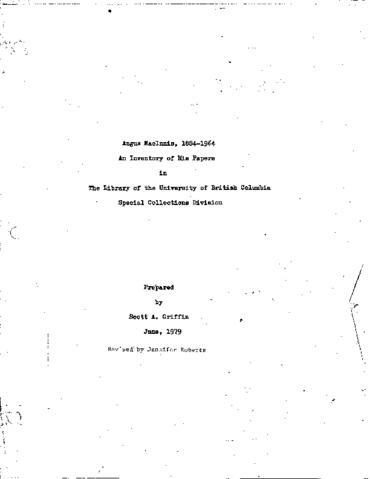 While it is physically part of the Angus MacInnis memorial collection, this fonds was processed as a standalone fonds and has its own finding aid which is separate from the memorial collection. Three fonds were set up as part of the Angus MacInnis memorial collection: Angus MacInnis fonds, Ernest E. Winch fonds, and Francis J. McKenzie fonds. In 2017, the archivist decided to intellectually separate the Angus MacInnis fonds, Ernest E. Winch fonds, and Francis J. McKenzie fonds from the Angus MacInnis memorial collection due to confusion caused by the physical and intellectual arrangement of the collection. These fonds are now accessioned in this database with their own accession numbers. Physical location of this fonds is box 70 to 75 in the Angus MacInnis Memorial collection.